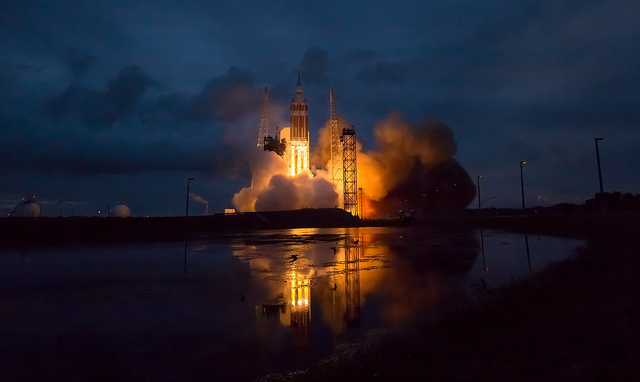 February 19, 2015 – NASA’s Orion spacecraft continues on the agency’s journey to Mars as engineers analyze data from the spacecraft’s December flight test and make progress developing and building the spacecraft for its first mission atop NASA Space Launch System (SLS) heavy-lift rocket. On future missions, Orion will send astronauts to an asteroid and onward toward the Red Planet. At machine houses across the country, elements of the primary structure for the next Orion to fly in space are coming together. Avionics components are being built and simulators for the ESA (European Space Agency)-built service module that will house the spacecraft’s propulsion and solar arrays are being delivered. By the end of the year, engineers hope to have the primary structure for Orion’s next mission to NASA’s Kennedy Space Center in Florida for processing. Meanwhile, every piece of data and each element of the spacecraft flown in the December test is being analyzed and compared to pre-flight models to improve Orion’s design. Engineers and technicians at Kennedy, where Orion was assembled and returned after its flight test, recently took off the back shell and heat shield that protected Orion during its reentry to Earth’s atmosphere, to unload unused propellants and allow for a close-up analysis of the spacecraft’s systems. 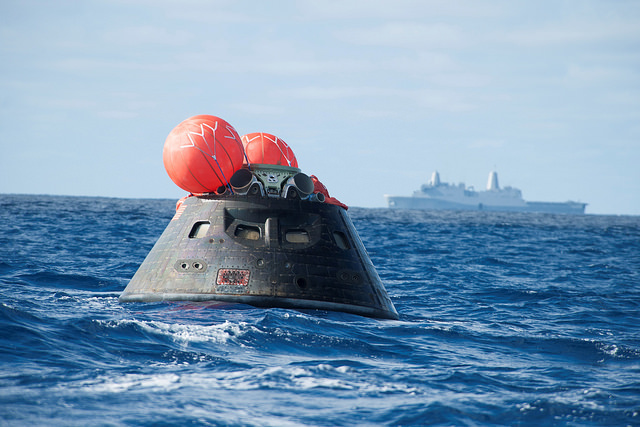 One of the main objectives of Orion’s flight, which sent the vehicle 3,600 miles into space during a two-orbit, 4.5-hour test, was to test how the spacecraft would fare returning to Earth at high speeds and temperatures. In March, the heat shield will be shipped to NASA’s Marshall Space Flight Center in Huntsville, Alabama, where the ablative material on the heat shield will be taken off. From there, the heat shield structure will be shipped to the agency’s Langley Research Center in Hampton, Virginia, where it will be reused on a test capsule for water impact testing. NASA and Lockheed Martin also are taking a look at potential modifications to the heat shield’s design to make it even stronger. Evaluating how the thermal protection system fared during Orion’s reentry wasn’t the only critical objective of the flight. The test also provided important insight into key separation events, including whether the Launch Abort System and protective fairings came off at the right times, how the parachutes assisting Orion during its descent fared and how the operations to recovery Orion from the Pacific Ocean progressed. According to Hawes, all of the spacecraft separation events happened within fractions of a second of when predictive models said they would occur; Orion’s 11 parachutes worked to allow the spacecraft to touchdown in the Ocean relatively gently; and the recovery team of NASA, U.S. Navy and Lockheed Martin personnel recovered it within about six hours. The flight also examined the performance of a 3-D printed vent. It performed well, so teams will be looking at other hardware that could be made using the additive manufacturing process. Engineers are taking a closer look at the crew module uprighting system airbags on top of the crew module, which help keep Orion stable in the water after splashdown. Only two of five of the bags properly inflated during the December flight test. Initial analysis of the gas and plumbing system for the bags came up clean, and engineers suspect a possible issue with the bags themselves. “We’re in the midst of troubleshooting that now,” Hawes said. Orion’s flight test yielded millions of elements of data, every piece of which is providing unique insight into how to improve the spacecraft’s design so that it can safely send astronauts on their way to Mars and return them home.